Brave Therapy is an innovative bio-psycho-social chronic pain rehabilitation approach based on the most current pain and psycho-social neuroscience and practice research. It is a program that empowers you to become an active participant in the problem solving, pacing, and decision making of your own treatment and recovery while learning to self-manage your pain. The Brave Therapy program includes Living Brave groups and individual sessions designed to facilitate and support your success. How to rebuild your life, restore your body, and renew your joy! Current research confirms that chronic pain is influenced by three systems in each individual. Assessments and therapy address all three systems and their influence on chronic pain. This type of comprehensive bio-psycho-social approach has been validated by research to be the most effective type of pain rehabilitation program as opposed to former traditional treatments that focused exclusively on the physical or psychological symptoms. Linda has gone a step further in her treatment approach by integrating sensory processing assessments and treatment, Graded Motor Imagery, sleep hygiene, health coaching, detailed activity analysis of measures of pleasure, productivity and restoration, occupational therapy physical and mental health interventions. and integrating Brene Brown's Daring Way™ and Rising Strong™ curriculum into the pain rehabilitation process. Linda also collaborates with other caring professionals, including counselors, massage therapists, yoga, movement, and dance instructors, personal trainers, physical therapists, physicians, acupuncturists, reflexologists, and others to help build a community of empathetic healing individuals for each client. The Brave Therapy program will helps pain sufferers develop pain resilience through a whole-life, whole-body therapeutic process. Occupational Therapy is an evidence-based, science-driven profession that strives to help individuals live life to the fullest. Occupational therapy helps people function in all of their environments (e.g., home, work, school, community) and addresses the physical, psychological, social, and cognitive aspects of their well-being. Occupational Therapists believe that to be healthy and happy people must be able to participate in the activities and roles they want and need to do (occupations). Developing personalized life goals and strategies for creating a life balance between work, rest, and play are also integral components of the occupational therapy treatment process. 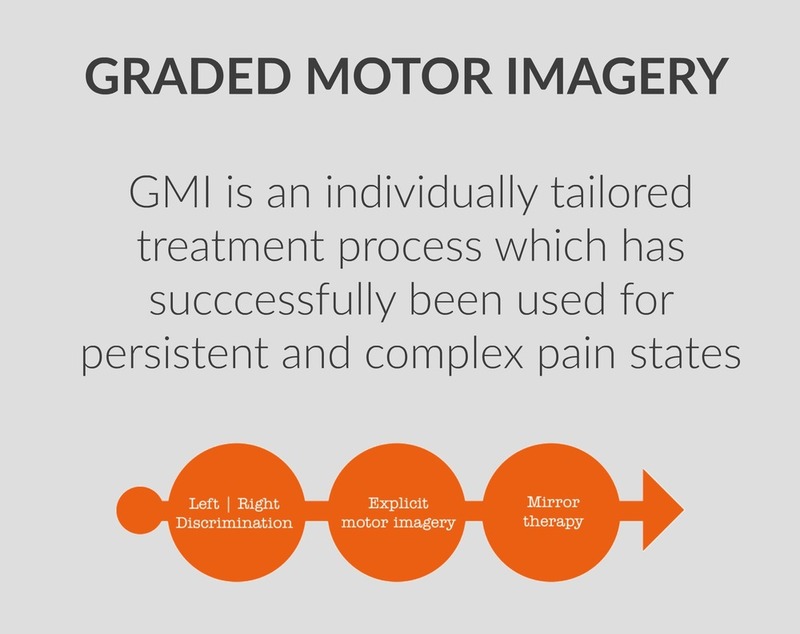 Graded Motor Imagery (GMI) offers a novel three stage synaptic exercise approach for neuropathic pain. As a bio-psycho-social treatment approach, GMI not only takes into account what has gone wrong in the body and brain (the 'bio') it also incorporates the influence of psychological and social variables. GMI has been developed based on the current neuroscience of brain pathways, brain plasticity, mirror neurons, and knowledge from psychology and physical rehabilitation. Through a deep learning process of the physiology of chronic pain, the contextual influences on pain (time, place, emotion, knowledge), and individualized motor imagery treatments, GMI aims to alter pain sensitive networks in the brain for the achievement of significant pain reduction. Graded Motor Imagery, in addition to treating other types of chronic pain, has been shown to be an effective treatment for the difficult-to-treat pain conditions of CRPS (Complex Regional Pain Syndrome) and phantom limb pain. It is an approved treatment by the Colorado Division of Workman's Compensation for the treatment of CRPS. It takes courage to heal from chronic pain, requiring a mental shift away from looking for quick physical fixes to embracing a slow, persistent process of self-discovery and guided skills training. It takes developing a courageous belief, not in pain treatments, but in our own ability to change our pain. This belief is called self-efficacy. Self efficacy "reflects confidence in the ability to exert control over one's own motivation, behavior, and social environment." The development of low self-efficacy has been identified as a contributing factor in the chronic pain experience. As a result of the many losses of independence, social engagement, and finances chronic pain sufferers experience, it can become increasingly difficult to believe in the ability to influence or control the healing process. Feelings of unworthiness, shame, and loneliness can become overwhelming. Learning the skills to begin Living Brave with chronic pain is a vital part of the healing process and the both the Daring Way™ and Living Brave ™ curriculum provide a unique method to learn how to show up, be seen, and live brave as we re-write our pain stories. Linda credits the psycho-social work of The Daring Way™ for contributing to her own recovery from chronic pain. As one of the first OT ‘s to pursue certification and the only certified facilitator to adapt and integrate Brené Brown's work for the treatment of chronic pain, she is honored to be able to share this life-changing coursework with her clients. Read more about The Daring Way™ here. See Linda's Certified Daring Way™ Facilitator profile here. "Individuals who participate in these programs have significantly increased their ability to cope with pain. They improve their ability to be active, healthy, and involved members of their communities."